The picture above shows the Boston Station of the Buffalo and Susquehanna Railroad. The Feed Mill owned and operated by the C&W Faulring Company is seen behind the station. In November 1905, Christ and Will Faulring purchased a strip of land adjacent to the railroad, comprising 1½ acres, from George and Victoria Gasper. From this parcel, they sold about one-half acre to the B&S Railroad, which likely became the site of the railroad station depicted above. The remainder of the land served as the site of their feed mill and an access road. 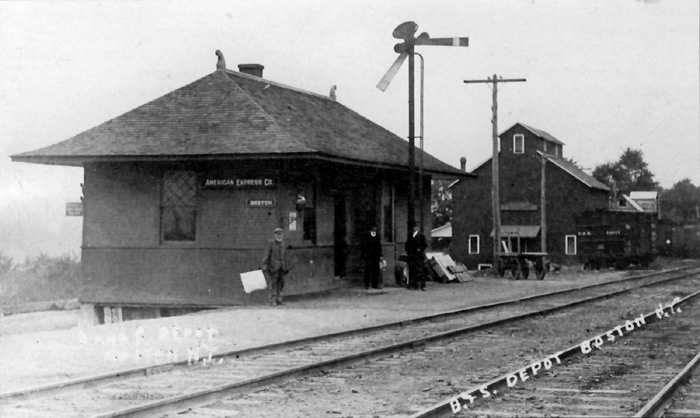 From the foregoing it would appear that the feed mill and railroad station were built in 1906, or shortly after. At the same time, Christ and Will leased land from the Baltimore and Ohio Railroad in the Town of Colden, where they built and operated a second feed mill. Members of the Faulring family operated these feed mills for the next 40 years. 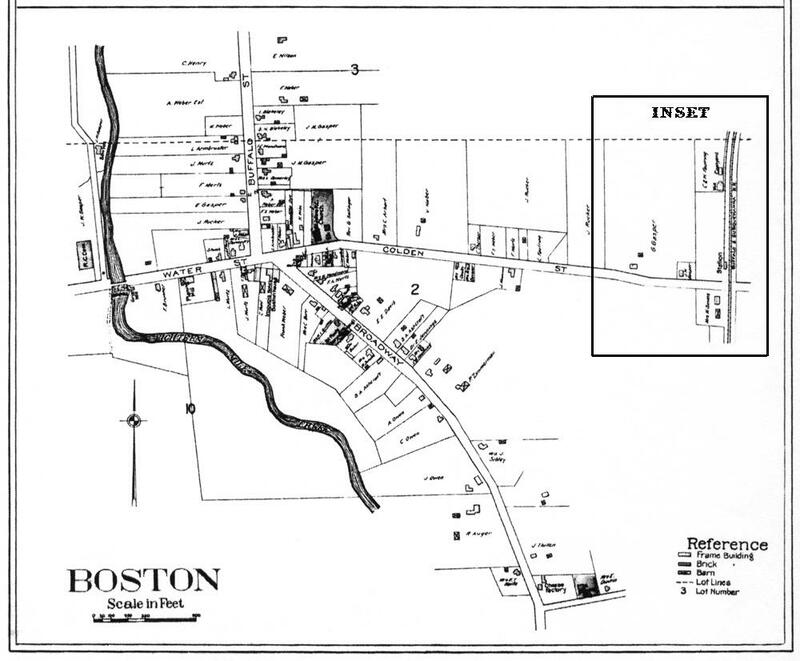 Initially, it appears the business was in the hands of Christ and Will, and the Boston mill continued to operate despite closing of the railroad in 191658. In 1918, however, brothers George and Ferd joined the partnership13. At the same time, the expanded partnership agreed to operate shipping facilities in Colden for the Buffalo, Rochester and Pittsburg Railroad (formerly the Baltimore and Ohio Railroad)13. C&W Faulring and Company continued to operate until 1938. However, as his brothers became older, George became more fully involved in the operations of the feed mills. Then in 1939 George entered into a new partnership with DeLee Owen and his son, Herold Faulring, forming Faulring, Owen and Company13. This new firm then leased the feed mill operations in both Boston and Colden, which they continued to operate until 194513, when Faulring, Owen and Company sold the feed mill operation to DeLee Owen and David May and the partnership was dissolved 13. 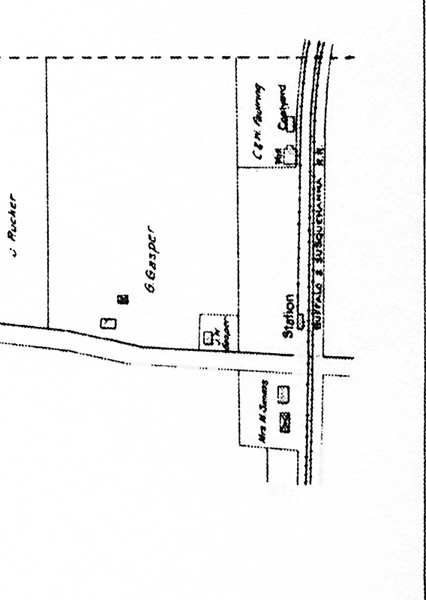 The 1909 map and inset, shown below, identify the location of the Faurling Mill. The B&S Railroad occupied a right-of-way about one-third of the way up the hill East of town.